Looking for an app to easily control and configure your touchpad in Ubuntu Desktop? Touchpad Indicator, an open-source system tray applet, is well worth a try. Keyboard shortcut to quickly disable/enable touchpad. Ability to disable touchpad on typing. For those who don’t want to add PPA, grab the .deb package from HERE and click install via Ubuntu Software. The PPA can be removed by going to System Settings -> Software & Updates -> Other Software tab. 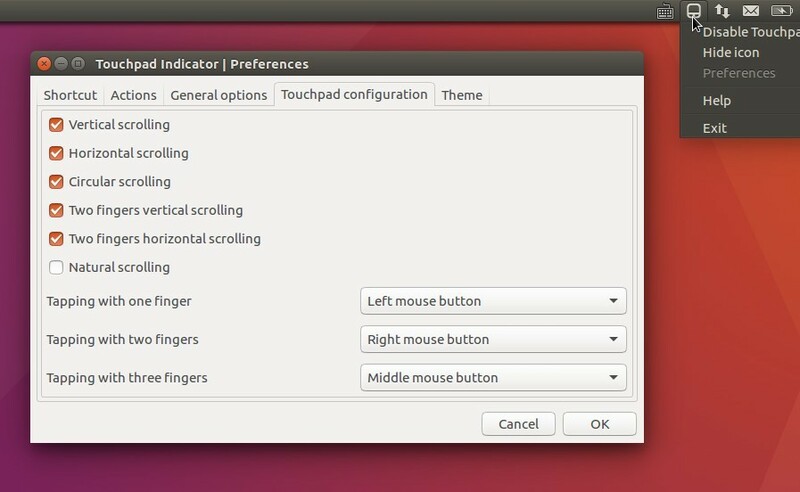 /opt/extras.ubuntu.com/touchpad-indicator/bin/touchpad-indicator:29: PyGIWarning: Notify was imported without specifying a version first. Use gi.require_version('Notify', '0.7') before import to ensure that the right version gets loaded. /opt/extras.ubuntu.com/touchpad-indicator/share/touchpad-indicator/touchpad_indicator.py:30: PyGIWarning: AppIndicator3 was imported without specifying a version first. Use gi.require_version('AppIndicator3', '0.1') before import to ensure that the right version gets loaded. I installed the program, but it will not start. The icon sits in the dock for a couple of seconds then disappears. Help!